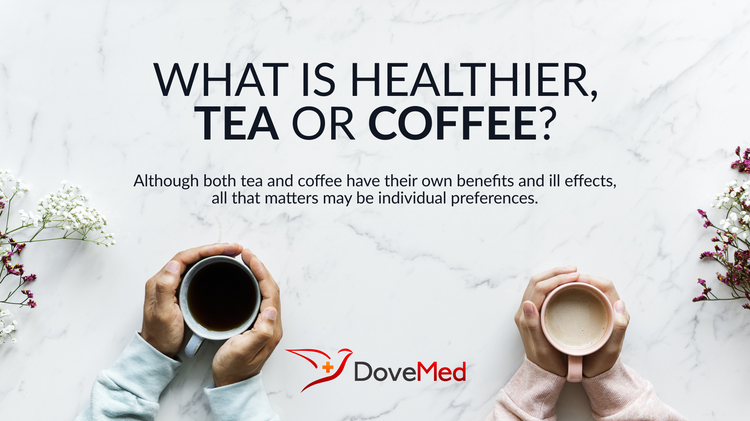 What Is Healthier - Tea Or Coffee? The researchers found that people who drank coffee had a higher Cardio Vascular or CV risk profile as compared to non-drinkers, particularly if the drinkers also smoked. On the other hand, physical activity also increased with an increase in the number of cups of tea per day. While most people do not opt for tea or coffee keeping its positive or adverse effects in mind, it is interesting to examine which one is better. While most researches point towards the fact that tea is overall beneficial, a few also suggest that people at risk for Alzheimer`s disease are healthy sipping on coffee. Drinking tea brings down non-cardiovascular mortality by about 24%, reveals a study that was carried on 1,31,000 people at the European Society of Cardiology Congress by Professor Nicolas Danchin from France in 2014. The study was named “Cardiovascular Disease Prevention- Risk Assessment and Management”. The epidemiological and laboratory indications seem to suggest that drinking tea may be inversely related to the development of chronic diseases. Tea contains fluoride that protects teeth. Researches show that coffee causes teeth discoloration. Drinking 3 to 4 cups of tea per day can cut down the risk of heart attack. Coffee is suspected of having variety of adverse effects, although recent researches have proved that moderate consumption is safe. Its positive effects are still undergoing investigation. A study in Denmark shows that consuming 8 or more cups of coffee per day can significantly affect the chances of stillbirth. For this reason, the Food and Drug Administration advises pregnant women from consuming too much coffee, particularly if they are smokers. Tea, on the other hand, is a declared safe beverage and plays a vital role in preventing cancer and cardiovascular diseases. Tea has a marked effect on blood pressure in comparison to coffee, with a 4 to 5 mmHg decrease in systolic blood pressure in moderate drinkers and a decrease of 3 mmHg in diastolic blood pressure in heavy-drinkers, when adjusted for age. Tea (particularly green tea) has many antioxidants that help in providing a person with survival benefits. Tea drinkers have healthier lifestyles and are less addicted to smoking. Black tea consumption may reduce the chances of stroke. Researchers Shen and colleagues in their “Tea consumption and risk of stroke: a dose-response meta-analysis of prospective studies” published in 2012, have researched this subject. Similar evidence has been put forward by Larsson in “Coffee, tea and cocoa and risk of stroke” published on January 2014. The American Academy of Pediatrics recommends that an adolescent should not consume more than 100 mg of caffeine per day. 237 ml of brewed coffee has 95 to 200 mg of caffeine. 237 ml of black tea (brewed) has 14 to 70 mg of caffeine and 237 ml of green tea (brewed) has 24 to 45 mg of caffeine. 237 ml of black tea (brewed) decaffeinated has 0 to 12 mg of caffeine. Brewed decaffeinated coffee has 2 to 12 mg of caffeine. This clearly shows coffee has more amount of caffeine than tea. Excessive consumption of caffeine might result in anxiety, insomnia, headaches, restlessness, high blood pressure, and fast heart rates. Completely cutting down on tea or coffee consumption completely is not required; consuming them in moderation is recommended though. Slight dietetic factors have to be considered during the consumption of any beverage. Though both tea and coffee have their own benefits and ill effects, all that matters may be individual preferences! Binns, C. W., Lee, A. H., & Fraser, M. L. (2008). Tea or coffee? A case study on evidence for dietary advice. Public health nutrition, 11(11), 1132-1141. Klatsky, A. L., Armstrong, M. A., & Friedman, G. D. (1993). Coffee, tea, and mortality. Annals of epidemiology, 3(4), 375-381.